Today I took pleasure in baking for someone else for a change. I say someone else but I really mean my best furry friend, Hans our tri border collie. Almost three years ago, we headed to a farm in Loughborough to meet this little fellow at just 8 weeks old. The moment I picked him up, he surrendered on my bosom. So innocent and adorable, he eventually grew in to a barky young man, but still so gentle and cuddly. Cats would disagree, I’m sure. They just don’t get him. So a little while back in my non-blogger days, I made this cake for our little man after seeing a friend post a picture of hers on Facebook and just had to made it. I topped it with cream cheese and he enjoyed every little bit. 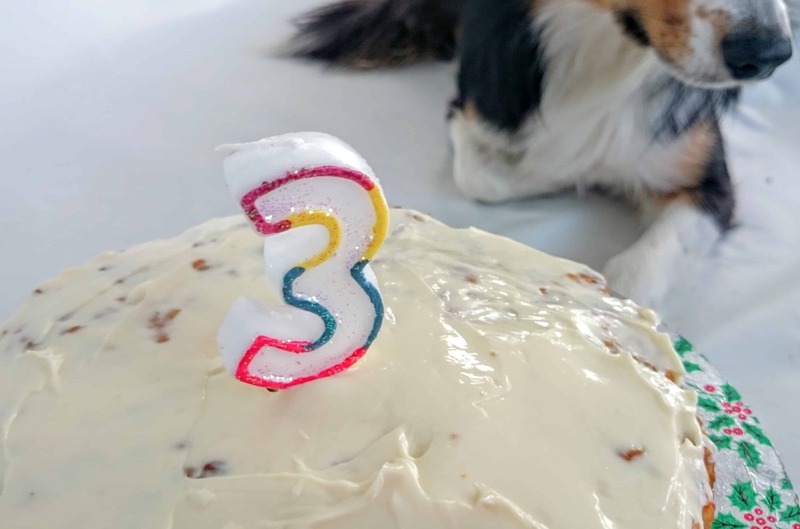 Unfortunately I was too busy to do this last year and a selection of dog treats sufficed, but this year now I have a food blog, I couldn’t resist! It’s human friendly and well liked by many others on the internet. However, my only hesitation is that I have seen an awful lot of contradictory advice of what is good for dogs and what is bad when I look up this recipe. I suppose they’re a lot like us in that we all have our own sensitivities. But it’s the flour I’m talking about. 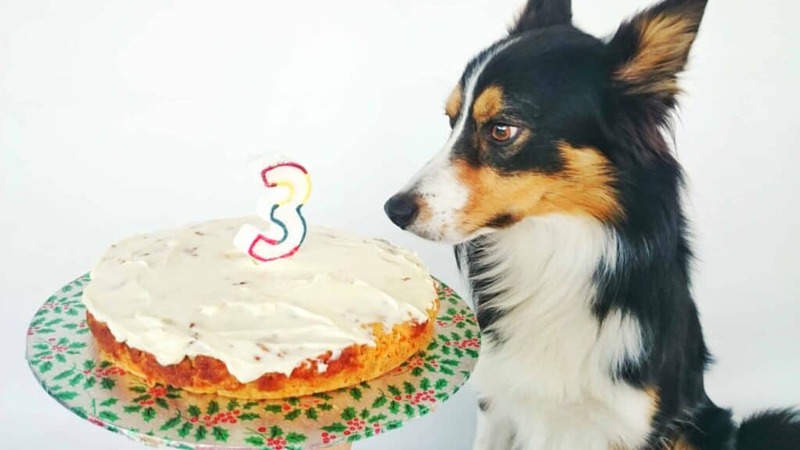 I’ve seen a lot saying that plain flour is bad for your dog and to be safe, you’re best using whole wheat flour, yet plain flour is an alternative? Anyhow, I used plain flour the first time round and Hans seemed perfectly fine. Unfortunately yet again this year I had no wheat flour in the house, so I just carried on with what I had. You can use whatever topping you know you’re dog will enjoy. I know one of Hans’ favourite treat he works hard for is cheese. He loves it! So I chose Dairylea cream cheese which is all natural ingredients. Here’s the recipe to try. It’s incredibly simple, apart from the monotonous carrot grating, but anything for my best friend to make it his special day. Blend together the egg, peanut butter, oil, extract and honey if using in a large mixing bowl. Mix in your grated carrot. Sift the flour and baking powder and fold in to the cake mixture until mixed in. Line a round 8″ round cake tin or similar or 6 muffin tin and pour in the mixture. Remove fro oven and leave to cool a little, then transfer to a cooling rack. Once cooled, spread cream cheese on top or similar if using and decorate with candles of your choice. Let me know if you made this and what you and your bow-wow thought of it. Hans say “four paws”! OMG!!! This is Amazing. Very very yummy for dogs and people (My Friends Had a Snack) I give you 5 stars.